The BMW i8 has received a range of mid-life tweaks, and it remains the only car on sale that looks and drives like a supercar, can cover 34 miles on electric power, and has an official fuel economy figure of 150mpg. 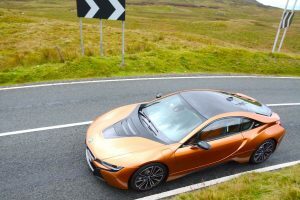 We reviewed the BMW i8 when it was launched in 2014, but it’s now had a mid-life refresh – not visually, but aspects such as the powertrain have been tweaked, to give a longer range and to allow it to perform better on the new WLTP fuel economy test. It still remains the only car that looks and drives like a supercar, but that can also drive 34 miles on electric power with official fuel economy of 150mpg. 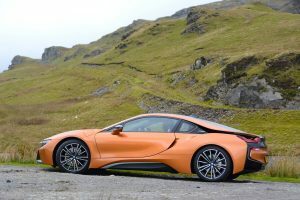 Let’s start with the design, which hasn’t changed, but it probably didn’t need to, as the i8 remains eye-poppingly dramatic when at a standstill, and it’s even more spectacular when the dihedral doors are opened upwards. 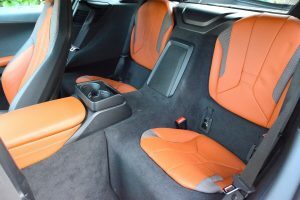 The interior also has a futuristic feel, yet the i8 combines this interior design with the normal levels of BMW functionality. As a 2+2, it even has two small rear seats for children. There’s also a luggage compartment behind the engine, although this doesn’t offer a great deal of space, especially with two charging cables stored in here. So the exterior looks amazing, the interior feels like a very special place to be, however it’s under the skin where the really interesting technology can be found. 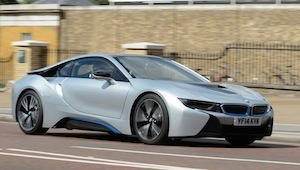 The i8 is a plug-in hybrid. 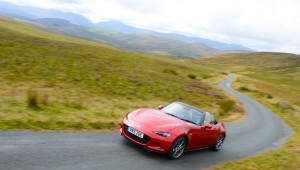 This means it has a petrol engine – mated to a six-speed Steptronic transmission – and an electric motor – with a two-speed automatic gearbox – powered by a lithium-ion battery. 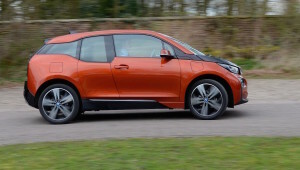 The energy capacity of the latest version of the i8’s lithium-ion battery has increased from 20Ah to 34Ah, and the electric motor’s peak output has risen by 12hp to 143hp. Judging by its looks, you might imagine that the ‘conventional element’ of the i8’s powertrain is something like a BMW 6-cylinder, 3-litre petrol engine. 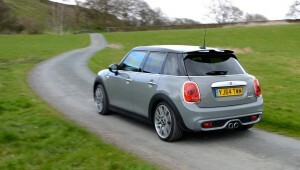 But no, sitting behind the occupants is a 3-cylinder, 1.5-litre petrol engine that originated from a MINI. A supercar with a 3-cylinder, 1.5-litre petrol engine? Really? But remember that there’s also an electric motor with a power output of 143hp, in addition to the 231hp of the petrol engine, giving a total system power output of 374hp. This is now sounding a bit more appropriate. It’s also worth noting that the petrol engine now comes equipped with a particulate filter. Then there’s the issue of how the i8 puts its power down to the road. The mid-mounted petrol engine delivers power to the rear wheels, and the electric motor sends power to the front wheels. 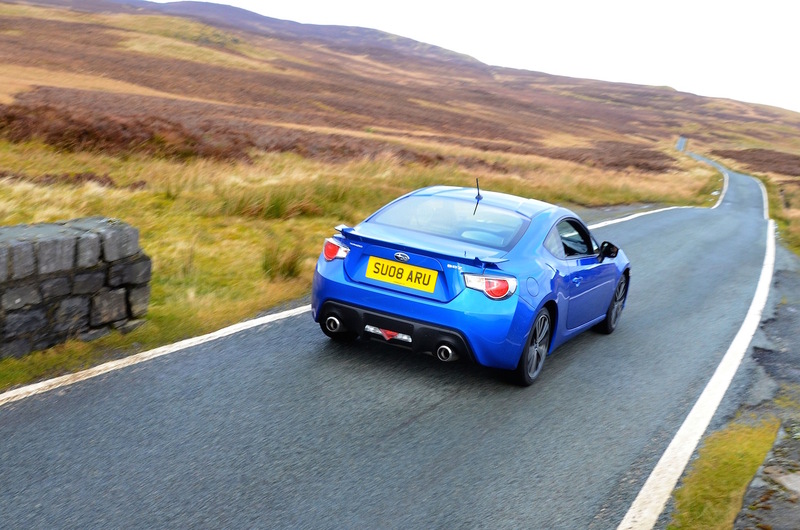 Combining these two propulsion systems results in all-wheel drive. 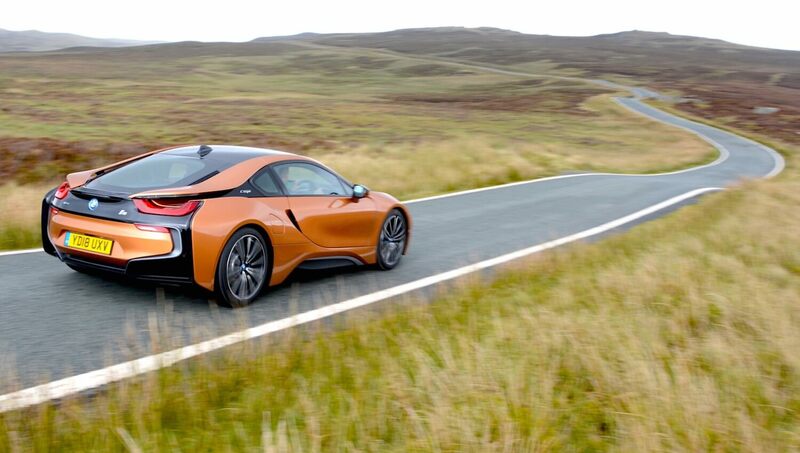 Despite having two powertrains, the i8 has a carbon-fibre reinforced plastic (CFRP) passenger cell, which helps to keep the vehicle’s weight down to 1,535 kg. The BMW i8 has the ability to drive up to 34 miles around town as a pure electric car, with zero tailpipe emissions. 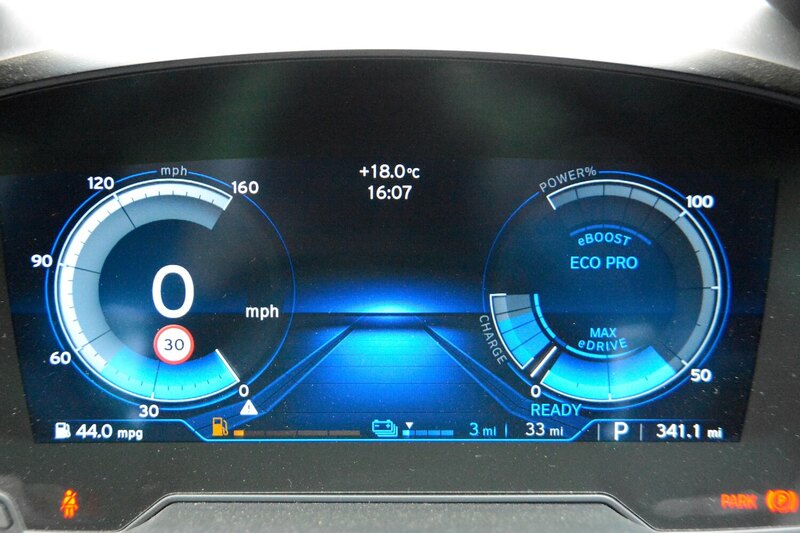 You can select the EV button to ensure the i8 doesn’t fire up the petrol engine. 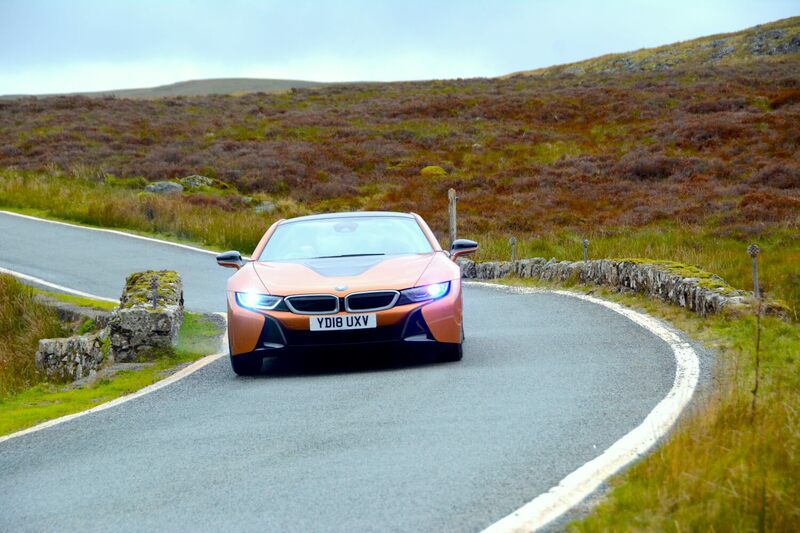 In fact, you can accelerate much harder in the i8 than you can in any other PHEV without the petrol engine cutting in – although if you really push it, this will happen. If you don’t select the EV button, then the i8 will be in hybrid mode. 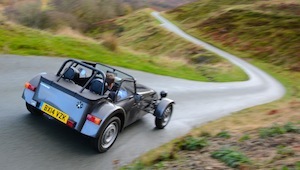 This means it will choose between using the petrol engine and the electric motor and battery. This translates to the petrol engine being used for most driving, but at low speeds/standstill you’ll be driving on electric power. You can also hold the charge of the battery, for instance if you’re driving down a motorway and then entering a built-up area, when you can cancel the battery hold and drive on the electric power that you’ve saved. Unlike some other PHEVs, there’s no button on the dashboard to hold the battery charge, instead you have to delve into a sequence of buttons on the touchscreen to do this. However, like the i3, you can set this battery hold function as a shortcut button. There’s also a switch offering two drive modes, Comfort and Eco Pro. Normal driving will be just fine in Comfort mode; if you’re looking to maximise economy on a long motorway run, then Eco Pro will do this for you. 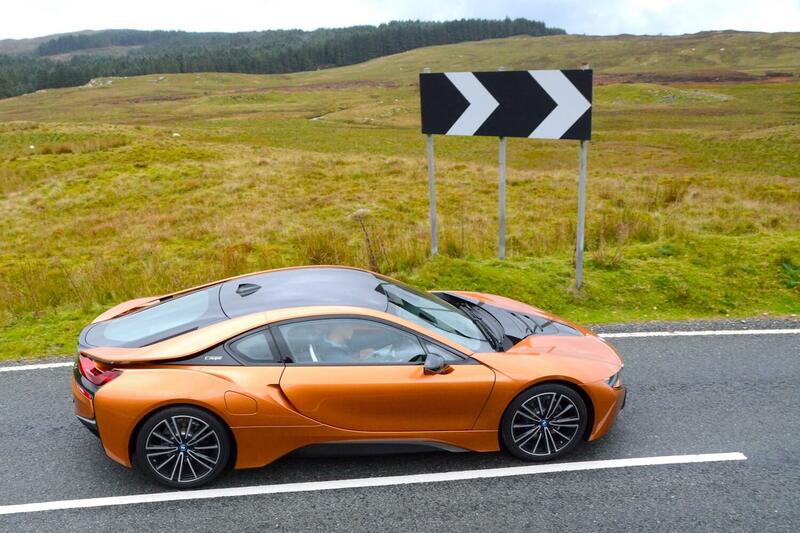 So the BMW i8 can be driven normally or economically, on petrol, on battery, or on both. 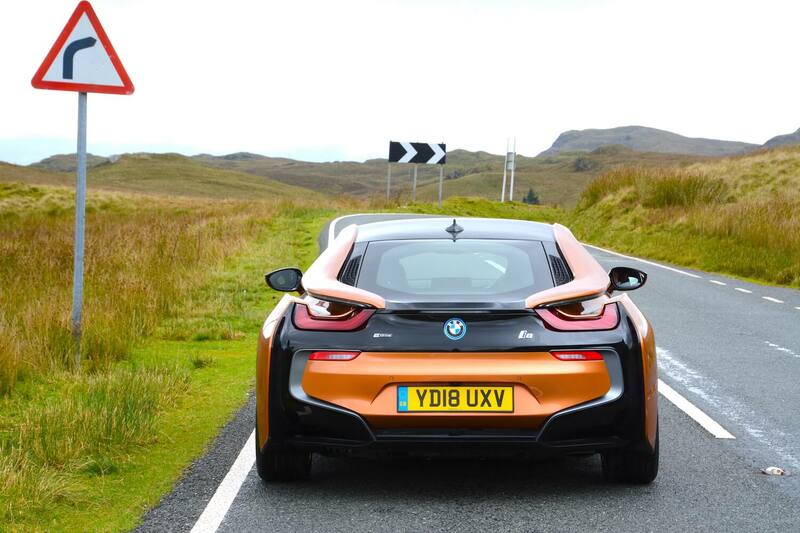 On electric power the i8 is predictably near-silent and very refined – as well as front-wheel drive. 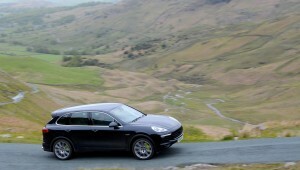 However it remains very civilised in petrol and hybrid modes. But then there’s another option. Push the gear selector to the left and you’re in Sport mode. The dials go red, and the head-up display changes from showing speed and satnav information to projecting a rev counter. 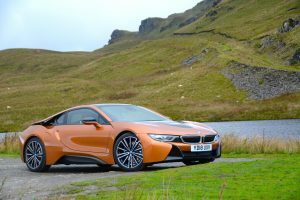 But the main difference that you’ll notice is a sporty engine note (even though this is synthesised and piped into the cabin), and the i8 also suddenly adopts a real get up and go character. 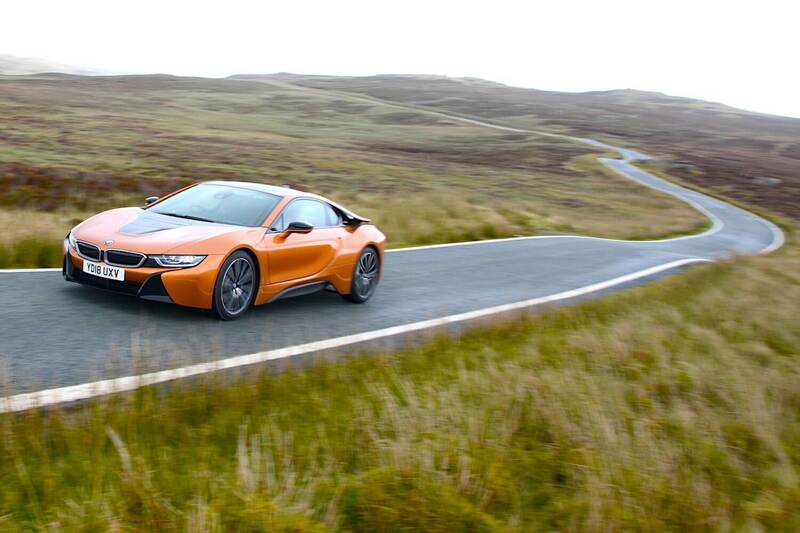 The i8 also puts charge back into the battery in Sport mode. So although Eco Pro was the mode of choice for motorway journeys from Manchester to the Prime Minister’s Zero Emission Vehicle Summit in Birmingham and then onto the Low Carbon Vehicle Show at Millbrook before heading back to Manchester, for a photoshoot in North Wales, Sport was the mode of choice. Having demonstrated the i8’s capability to achieve impressive economy on the three days of motorways journeys, North Wales offered the opportunity to remind ourselves what the i8 is like on some of the best drivers’ roads in Britain. The i8’s low centre of gravity is immediately obvious, as the car feels securely planted on the road. 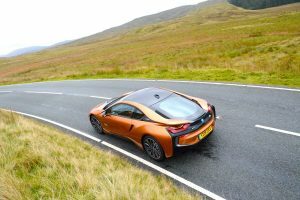 Unless you’re pushing the i8 beyond what is safe on public roads, you’re never really aware that the front tyres are narrower than the rears because the grip levels are reassuring (the main time you’ll be aware of the limitations of the front tyres is when accelerating quickly out of junctions in the wet in electric mode, ie. in front-wheel drive). Before we drove the original i8 when it was first launched, our main concern was how the different powertrains would shift the torque between the front and rear axles when pushing on through corners. Any fears we had were completely unfounded first time around, and nothing has changed with the latest model. 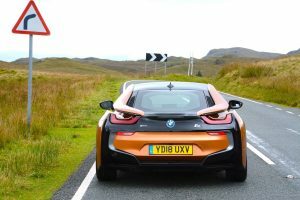 Like BMW’s best xDrive models, the i8 has the surefootedness of all-wheel drive, but with a rewarding rear-drive bias. 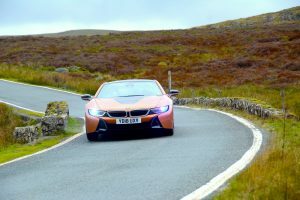 The i8’s steering is sharper and more precise than the majority of BMW saloons, and as well as the handling being mid-engined sports car-like, the ride is also respectable – although obviously not in the same league as a 5 Series. There’s also some road noise. But what about the powertrain? Can a 3-cylinder, 1.5-litre engine – even with back-up from an electric motor – really deliver the performace that the styling of this car promises? Amazingly, yes. Drive the i8 progressively along the sort of roads that you find in North Wales and you’ll have a highly enjoyable time. 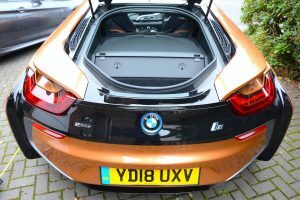 Okay, so we’re talking high end sports car performance rather than McLaren levels of speed, but the i8 offers everything you need to entertain, with less chance of losing your licence than with a McLaren or Porsche. The automatic transmission is excellent, and in Sport mode you can change gear manually using the steering-wheel mounted paddles – which is recommended for maximum driver interaction. BMW’s infomedia system also needs a mention, because it’s still pretty much the best in the business, and thanks to the rotary dial it’s still one of the few systems that allows you to effortlessly zoom in and out of the map look ahead to see how many crashes there are on the UK’s motorway network. 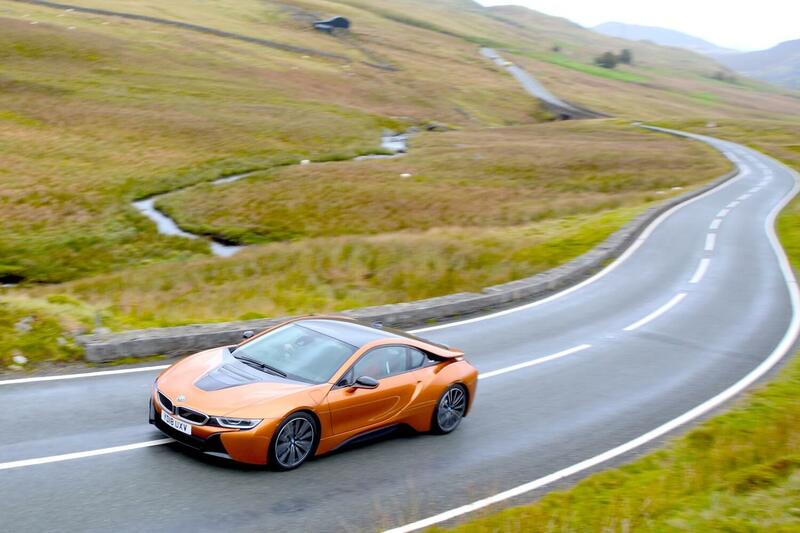 The official combined fuel economy for the BMW i8 Coupe is 149.8 mpg, with CO2 emissions of 42 g/km. 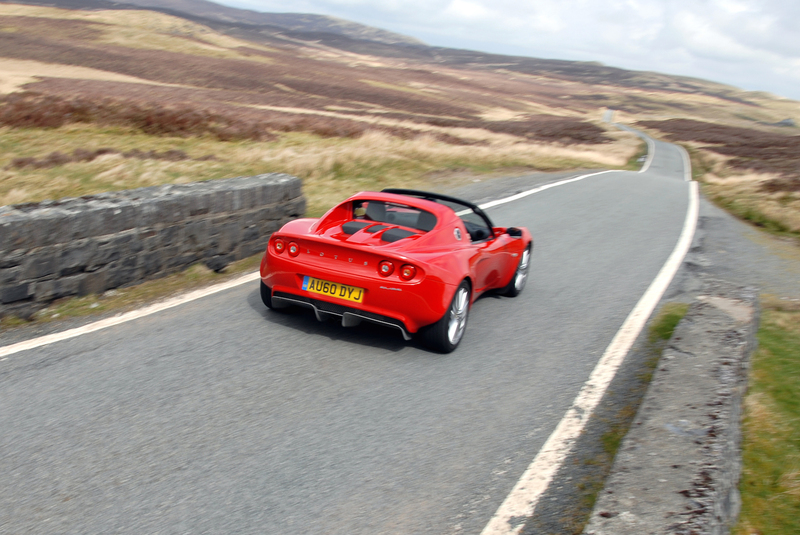 The official electric driving range is 34 miles – which is 50% more than the previous model. These are figures from the new WLTP test, but which have then been correlated back to the NEDC ‘equivalent’. 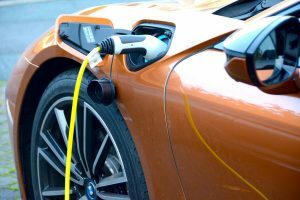 As regular readers of Green Car Guide reviews will be aware, the official combined fuel economy for PHEVs, in NEDC testing, and also in the new WLTP cycle, is irrelevant, because real-world economy will completely depend on how far you drive and what proportion of your journey is completed on electric power. In our real-world test outlined above, we averaged 44.0mpg on a 350 mile journey from Manchester to Birmingham to Bedford and back. 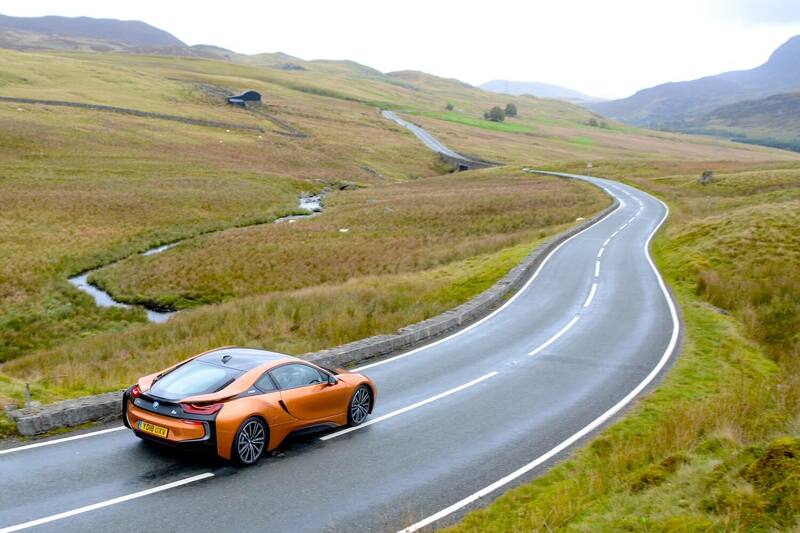 For a car that’s as good to drive as the i8, that’s a good result. Overall, we averaged 51.5mpg. Of course, if your driving is mostly local journeys and on electric power, then the 150mpg official figure could be easily achievable. 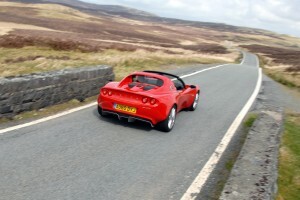 You can drive on electric power up to 75mph in eDrive mode. 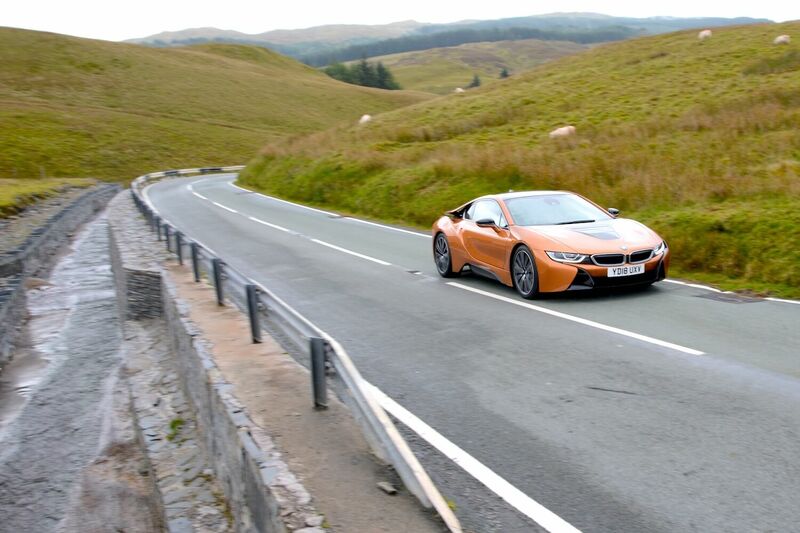 The i8 was displaying driving ranges between 380 and 500 miles when the fuel tank and battery were both full. Like any plug-in vehicle, you’ll need to plug in the i8 to charge it. A home charger is recommended, and you can also use fast and rapid public chargers around the UK. The BMW i8 Coupe costs £112,645, including the ‘E-Copper with highlight Frozen Grey’ metallic paint (£645). Options on our test car included ‘Accaro 2’ BMW i interior design (£750), 20-inch alloy wheels (£500), leather engine cover (£1,075), BMW Laserlights (offering a non-dazzling high-beam range of up to 600 metres) (£5,100), Apple CarPlay preparation (£235), and online entertainment (£160), totalling £9,820, and with delivery, registration fee and number plates, bringing the total to £123,200. It’s not a cheap car to buy, but the i8 does have a low Benefit on Kind tax rate of 13%. The BMW i8 Roadster is also now available, priced from £124,730. 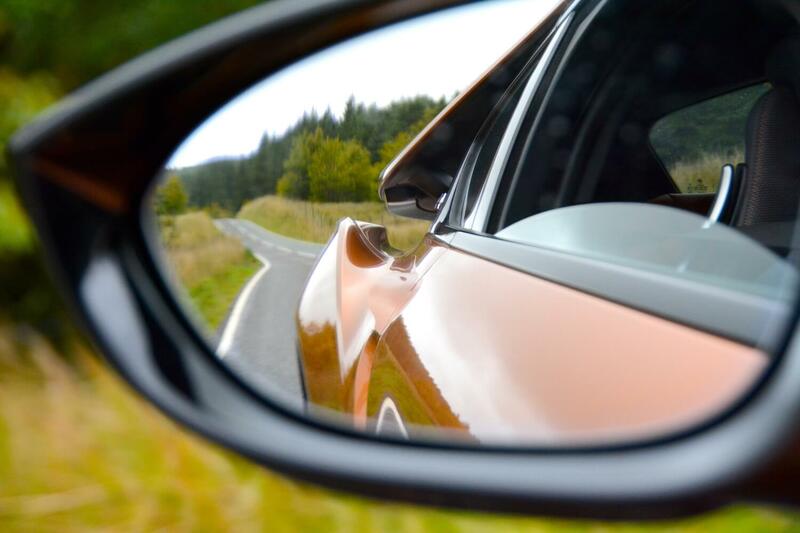 The BMW i8 was a groundbreaking car when it was first launched in 2014, and it remains a groundbreaking car today. 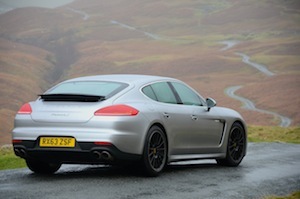 There have been comparison tests in the media with the likes of the Porsche 911. However in our view the BMW i8 can’t really be compared to such cars, because no other car does what the i8 does. It can drive up to 34 miles on electric power. 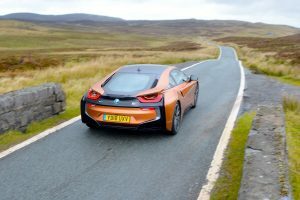 It can drive over 350 miles around the UK’s motorway network and average 44.0mpg in real-world driving, with the battery only being charged before initially setting off (the real-life economy would obviously be much higher over shorter distances with a fully charged battery). It can deliver a highly rewarding driving experience on the right roads. It looks amazing. The interior is well designed and functional. And it’s easy to live with. What other car can match that? Of course the answer is that no other car is on sale that can do this. 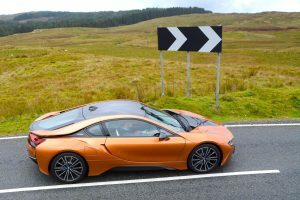 Which is why the BMW i8 remains an almost perfect embodiment of what Green Car Guide stands for – cars that are efficient and great to drive – and so there can be no other verdict but the retention of a Green Car Guide rating of 10 out of 10. The BMW i8 is the world’s first plug-in hybrid supercar with a three-cylinder petrol engine, and it combines a top speed of 155mph with an official economy figure of 135mpg and emissions of 49g/km CO2. Green Car Guide exists to look for cars that are great to drive and also efficient – this combination doesn’t happen very often, but the Porsche Cayenne S Hybrid hits the mark. 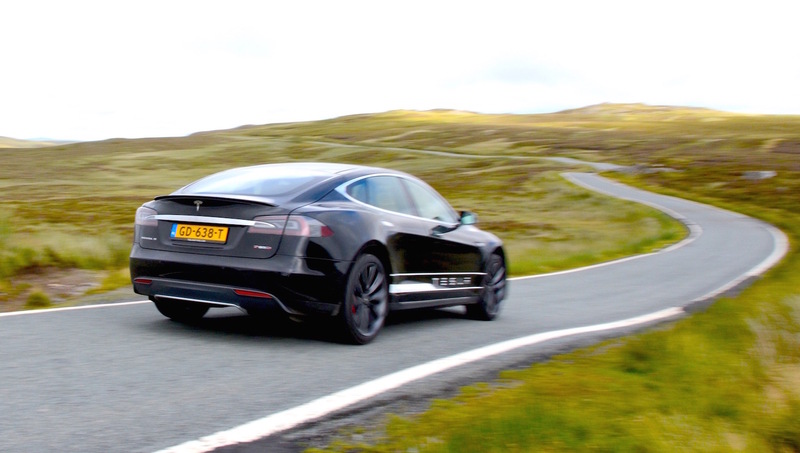 The Tesla Model S is probably the biggest revolution in motoring in the last 100 years, as Tesla has appeared from nowhere and produced an amazing all-electric sports saloon with a range of 300 miles, 0-60mph acceleration in 3.1 seconds – and it can even seat up to 7 people. 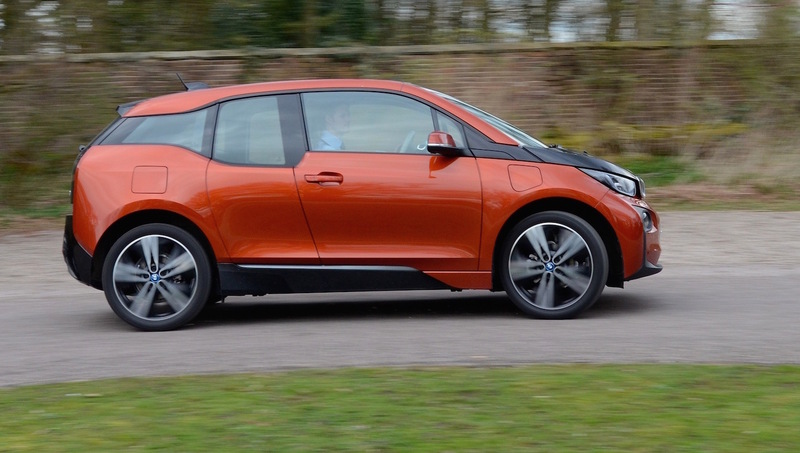 The BMW i3 is a rear-wheel drive pure electric or range-extended family hatchback, complete with BMW driving genes. The latest incarnation of the MINI delivers fun, character and refinement – along with performance and economy in the case of the 2-litre SD 5-door Hatch.